As the 11-women bike ride headed East on Washington Avenue, 20-year-old Mary Leopo realized where she was: riding in the middle of a travel lane. Leopo, a student at Santa Ana College, didn’t know cyclists had the right to take a travel lane. She usually rode as far-right on the street as possible, even if it meant riding in the gutter. 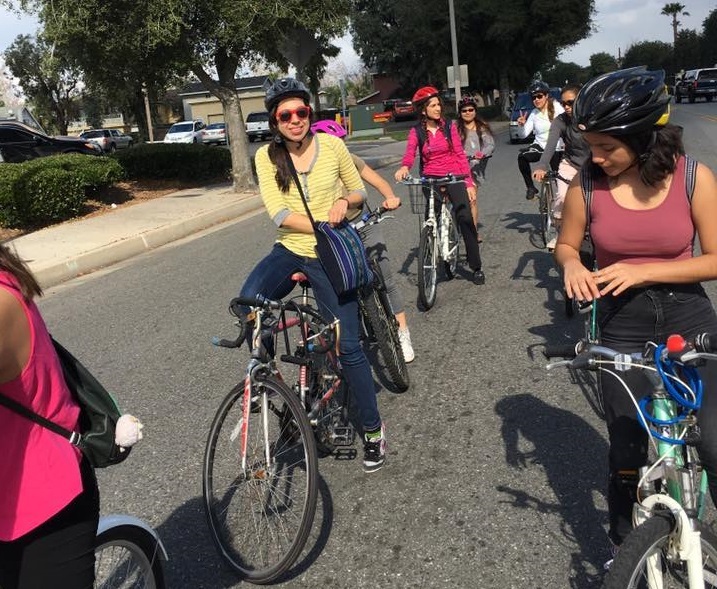 “It was very eye-opening that you actually have rights as a bicyclist,” Leopo said. 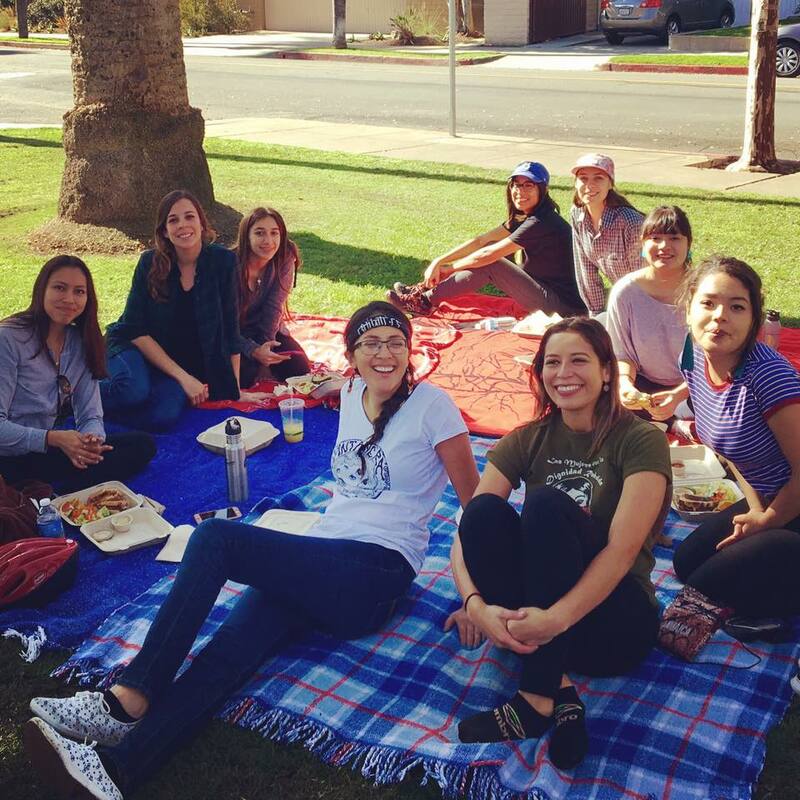 SAASy Mujeres is a collective of women identifying folks that host all-femme rides in hopes of meeting new people, getting healthy and learning about advocacy efforts in Santa Ana. It’s also a way for residents and community members who would want to ride around the city but otherwise don’t feel safe or confident doing so by themselves. This year’s six-month ride series took place every first Saturday morning of the month and ran from January to June. The rides were moderately paced rides of about 5-6 miles and usually involved eating a lunch at the end of the ride. 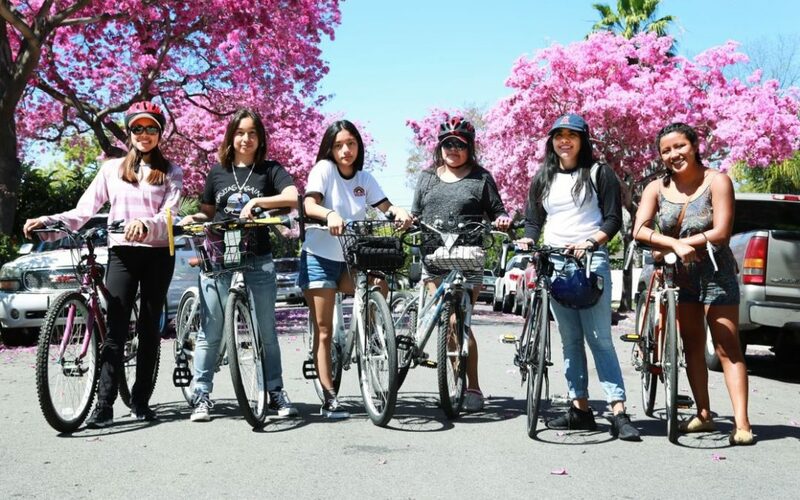 SAASy Mujeres was the brainchild of Lynnete Guzman and Marina Ramirez, both Santa Ana residents and longtime members of Santa Ana Active Streets (SAAS), a community and resident-led nonprofit that advocates for bicyclists, pedestrians and equitable active transportation in the city. As Guzman and Ramirez both got more involved in active transportation circles around the region and country, they noticed that white men were often the most prominent voices in these conversations. When women were present, they usually had very limited roles; when women were present, they were often white. “It was weird for us because in our Santa Ana world both of our mentors were women (of color)” Ramirez said. 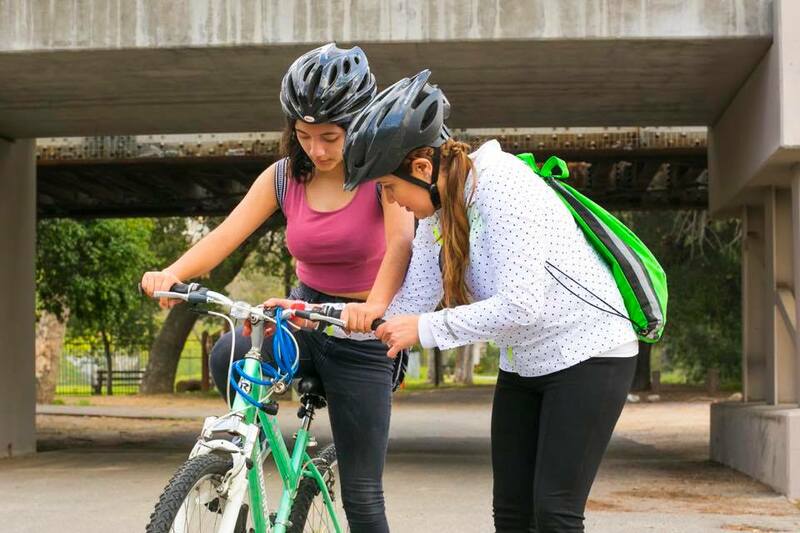 SAAS member Rosario “Charis” Perez, left, helps Mary Leopo with her bike during a SAASy Mujeres ride. The idea to do an all-women bike ride lingered with Ramirez and Guzman for years. They maintained conversations about the idea, often introducing ways they could do it through their work at SAAS. Then, last year, the two applied and received a $320 mini-grant from Santa Ana Building Healthy Communities to get the idea started. They recruited freelance photographer and Santa Ana resident Julie Leopo to help and the three began planning the rides. shared responsibilities in developing, organizing and lead rides. Leopo, Ramirez, and Guzman shared responsibilities in developing, organizing and leading rides. They wanted the rides to be fun, family-friendly, accessible to all levels of cyclicts, accessible to those who didn’t own a bike, and, most importantly, accessible to las mujeres de Santa Ana. Using equipment provided by SAAS, participants could borrow a bicycle and bike helmet. Lunch was also provided for at the end of most of the rides and was used as an opportunity to survey the ride participants on how the ride could be bettered. SAASy Mujeres bike ride headed south on Lincoln Avenue in Santa Ana. The organizers found quickly that preparing for an all-women ride also required thinking of women-specific needs. While a first aid kit and bike toolkit were standard on all the rides, they don’t come standard with tampons, Ramirez said. They learned that neither kit had one during a ride and packed some for future rides. While the rides ended last month, the organizers hope to continue hosting more rides later this year. One of the hopes the organizers had, Guzman said, was to also to bring new faces to the group in hopes they take the lead. For Mary Leopo, the rides gave her a chance to meet new people and learn new things about her city. As the group rode east on Washington Avenue, they also passed artist Carlos Aguilar’s mural dedicated to World War II veterans, a piece Leopo had never seen or known about before. She added that each woman would look after one another. When she had a problem changing gears, SAAS member and current interim chair Rosario Perez helped her fix the issue. “It felt like having a good time with my girlfriends,” Leopo said. Post ride lunch. A mini-grant from Santa Ana Building Healthy Communities helped the organizers purchase lunch and snacks for ride participants.